In this Gordon Ramsay's 24 Hours to Hell and Back episode, Chef Gordon Ramsay visits La Serenata Cantina, a Mexican restaurant in Rancho Park Los Angeles, California where he meets the Rodriguez family, Aurora owns the restaurant, son Marco Sr is the manager and his son Marco Jnr is chef in the kitchen. La Serenata is located in a prime location close to a number of movie studios but is failing to bring in customers. Marco's father owned a number of renowned restaurants but he sadly passed away and they were forced to sell two of their restaurants and Auroras house. Aurora and Marco Snr argue constantly and the family are stuck in the middle. Gordon arrives in disguise as a french tourist with a party from a tour bus. He thinks the decor looks grim and they order staple Mexican dishes. The server is sweating and it drips into the tortilla soup, which tastes disgusting. The breakfast burrito is gross and looks disgusting. The servers just dump the food on the tables and shout at the guests. Gordon removes his disguise and asks to meet the staff. He asks them all to come to his Hell on Wheels truck where he shows them hidden footage. The footage shows Marco and Aurora arguing, the kitchen washing old food, mounds of expired produce and cross contamination. The staff meet and they blame Marco and or Marco and Aurora for the failures in the restaurant. The renovations begin and Marco is not happy with the changes to the bar. Gordon inspects the kitchen and finds frost burnt chicken, old, rotten kale and tomatoes and the kitchen staff are told to clean the kitchen. Gordon asks Aurora and Marco for a heart to heart chat and Gordon is unsure he can fix the relationship. He has a heart to heart with Marco Jnr and he commits to stepping up. The kitchen staff are taken to the Hell on Wheels truck to learn the new menu. Marco and Gordon chat in his car and he admits he was not ready to take over when his father passed away. Marco apologises to the family and he promises to change. The staff sample the new menu and love the new food and new margaritas. The kitchen has been given a makeover with new equipment. Gordon works with Stone to improve customer service but he struggles and Gordon takes a time out. On relaunch, the customers love the new, fresh decor and there are a number of local food critics in the restaurant. Marco is panicking and it is spreading to the kitchen and the kitchen is cooking the same food twice. The critics and customers are left waiting and Gordon asks Marco to sort out the service as the problem is that they are taking the food to wrong tables. The food critics and customers love the new food. Three months later, Marco Snr is returning to his old ways, he has reverted to his old menu and Johnny has left leaving Marco Jnr alone in the kitchen and he has had to take a second job as he isn't being paid. La Serenata is open and Yelp Reviews are mostly positive with the fresh food and vegetarian/vegan options being a bit hit, there are negative comments that focus on poor service, high prices and customers being ignored when they enter the restaurant. Trip Advisor Reviews are also mostly positive, there are a few negative comments that appear to suggest there is an inconsistency with the quality of the food served, overpriced dishes and one review suggests that they have reverted to their old menu. They had previously owned other locations of La Serenata restaurants including their original restaurant La Serenata de Garibaldi in Boyle Heights, Los Angeles and one in Santa Monica but these locations closed. The second Los Angeles location closed in 2017 after 32 years in business and the Santa Monica location closed in 2011. 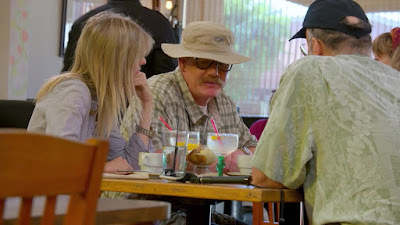 Yelp Reviews for the Boyle Heights location are average with similar comments to the restaurant featured in the episode. La Serenata was aired on July 18 2018, the episode was filmed in October 2017 and is 24 Hours to Hell & Back season 1 episode 5.